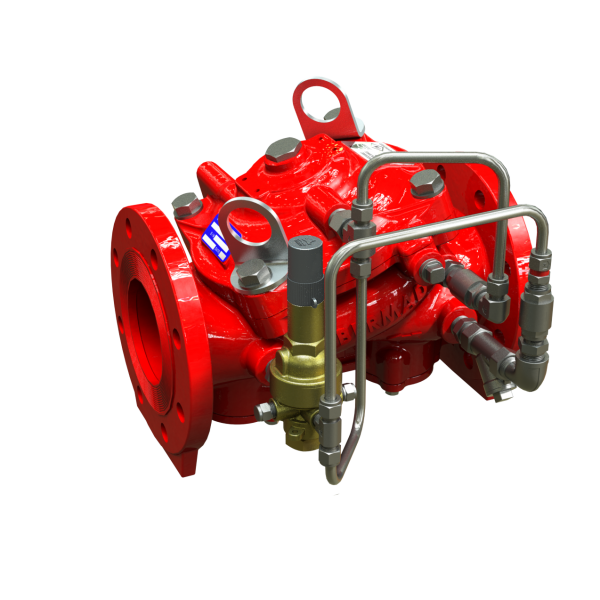 The BERMAD model 42T-20 is an elastomeric, hydraulically operated, self actuated Non Return Fire Pump Pressure Control Valve, designed for advanced fire protection systems meeting the NFPA-20 guidelines. The 42T-20 is used for controlling the flow and pressure at the pump discharge, performing also as a non return check valve. The 42T-20 prevents pump startup surge, typically caused by the accelerated water flow during the fire pump starts. The valve also helps to prevent pump start negative suction pressure, preventing pump cavitation damage. Due to exceptional reliability, safe actuation and low head loss, the 42T-20 is highly suited for fire pump discharge pressure control applications. As an option the 42T-20 can be fitted with a valve position indicator that can include a limit switch suitable for industrial monitoring systems.